Finalists have been announced for major awards celebrating the unsung heroes of critical control rooms. The APD Control Room Awards 2019 attracted almost 400 nominations from emergency services and other critical control operations, the vast majority recognising the extraordinary work of individual personnel. The awards are being staged for the second year in 2019 and have generated almost twice as many entries as for the inaugural event. Nominations for the nine award categories came from more than 60 organisations, including the first entries from the Maritime & Coastguard Agency and non-emergency services control rooms. As well as entries from across England, Scotland, Wales and Ireland, the awards also attracted the first participation from outside the British Isles, with nominations coming from as far afield as the United States. The APD Control Room Awards are the only accolades to recognise and celebrate the life-saving and life-changing work of staff in control rooms within emergency services and critical control operations. The shortlisted entries recognise the remarkable, behind-the-scenes work of control room staff in keeping the public safe and secure and responding to the most challenging and harrowing emergency incidents. The awards are run by APD Communications, which develops critical, life-saving software used by the police and other emergency services organisations across the country, as well as transport and aviation operators nationally and internationally. APD Managing Director Mike Isherwood said: “It was an emotional experience to read through the entries and a very difficult process to select the shortlists. “It’s humbling and deeply inspiring to receive hundreds of entries telling the stories of so many selfless individuals who are totally dedicated to serving the public. They represent a snapshot of the thousands of people working in control rooms who make a vital contribution, day after day, to a healthy, functioning society. Leading tech company telent Technology Services is the Platinum Partner of the awards and also sponsors the Award for Services to the Public. Barry Zielinski, telent’s General Manager, Public Safety & Defence, said: “We’re honoured to be the Platinum Partner of these prestigious awards and delighted that they have grown so strongly year on year. · Affini, a leading systems integrator specialising in wireless communications. · British APCO (BAPCO), the leading UK-based association for everybody who uses public safety communications and IT. · BAPCO Show 2019, the annual conference and exhibition that is a crucial event for everyone involved in critical communications and public safety solutions. · The Emergency Services Show and Emergency Services Times, published by Broden Media, a publisher and event organiser focused primarily on the emergency services sector. · Hexagon Safety & Infrastructure, a global leader in computer-aided dispatch software. · International Critical Control Rooms Alliance (ICCRA), which brings together critical control room professionals worldwide and co-ordinates discussion on key sector issues. · Northgate Public Services, the market leader for policing IT solutions in the UK. · Plantronics, which provides integrated solutions including headsets used by control room staff worldwide. · Red Box, a leading provider of communication recording solutions to store, retrieve, transcribe and analyse voice, instant messaging, video and data. · Sopra Steria, a European leader in delivering successful transformation programmes to top private and public sector organisations. · West Pier (Bronze sponsor), the award-winning provider of communications and networking products. The shortlisted entries were selected by a panel of six judges with extensive experience of working in or with emergency services and critical control organisations. Chris Dreyfus-Gibson, Vice Chairman, ICCRA. Sue Noyes, former Chief Executive of East Midlands Ambulance Service and Chair of The Ambulance Staff Charity (TASC). Cheryl Rolph OBE, former Assistant Chief Fire Officer and Director of Women in the Fire Service. Ian Thompson, Chief Executive of British APCO. In addition, a special John Gilhooly Unsung Hero Award will be announced at the awards ceremony. This award is dedicated posthumously to John Gilhooly who served in the Scottish Ambulance Service control room for almost 30 years. The winners will be announced at the APD Control Room Awards ceremony on Thursday 7 March 2019 at the De Vere Orchard Hotel in Nottingham when finalists and a select group of guests will enjoy an evening of celebration, reward and recognition. The cost of shortlisted nominees’ tickets will be covered, making it possible for all finalists to attend. Congratulations! Make sure you follow the #ControlRoomAwards on Twitter, Facebook and LinkedIn. 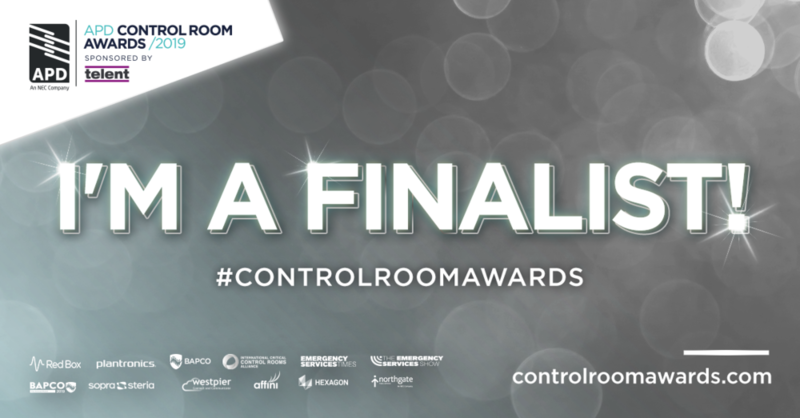 Download your graphics for social media below and tag #ControlRoomAwards in your posts!